Air-source heat pumps are a kind of renewable energy technology which take the warmth from the air outside (even when it’s cold) and use it to heat the home. You can also get heat pumps that do the same thing using the warmth in the ground and in water, but air source heat pumps tend to be suitable for a wider range of properties. And because the air (or ground, or water) is heated by the sun, the energy that heat pumps produce is still classed as ‘renewable’, even though the pump itself is powered by electricity. 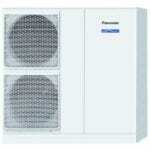 There are two types of air-source heat pumps. Air-to-water systems heat water which is then circulated around the home via radiators or an underfloor heating system. They can also be used to heat water in a storage tank for the bathroom or kitchen. Air-to-air systems typically use fans to circulate warm air around the home and cannot be used to heat water.